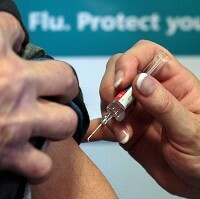 A drop in the number of people having the seasonal flu jab is causing concern among doctors. GPs have warned that those in at-risk groups, such as seniors, pregnant women and people with long-term health conditions, could be jeopardising their health by not coming forward to have the vaccination. There has been a 6% fall in the number of flu injections given this year compared with the same period in 2014, with surgeries in England vaccinating 100 fewer patients per practice, according to the Royal College of General Practitioners (RCGP). RCGP chairwoman Dr Maureen Baker called the figures "alarming" as she urged patients not to shun the jab, which she says provides valuable protection and "plays a key role in keeping vulnerable people as healthy as possible through the winter". The report, in conjunction with Public Health England, says unseasonably warm temperatures may be putting people off being vaccinated. Dr Baker says November has been "incredibly mild" this year, but cold weather is not needed for a flu outbreak. The last flu pandemic was in 2009. Influenza is a "horrible illness" that can also trigger a host of other health problems, she warns. The jab can also help people stay healthy while travelling abroad, alongside other necessary vaccinations and medical travel insurance. GPs believe some people may also be deterred from having the vaccine because of a perception that it had not been very effective last year. But Professor Simon de Lusignan, director of the RCGP Research and Surveillance Centre, described the effectiveness of the 2014 round of jabs as "reasonable". Prof de Lusignan, who is also a GP in Guildford, Surrey, says fridges at his surgery are full of unused doses as fewer vaccines are being given, and it is a similar picture across the 101 practices surveyed for the report. They revealed a reduction of 106 fewer vaccines on average at each surgery compared with the same period last year.